I'm curious if anyone out there has gotten higher % numerical value badges since the update? I know FLAT BADGES got a big boost, but I'm curious to see what the community is getting for % badges. You know things would be much simpler if NG just told us what the improvements actually were, rather than us playing these long winded guessing games. How difficult is it for them to just tell us the differential values? I'll be happy if people can post more exceptions to the bonus rounding issue, so far it works for the numbers I have seen. Edit: Thanks to @jimmorrison369 for explaining the display bug, chart updated accordingly. When (main effect - 2)/8 = integer, then the bonus value SHOWS rounded down. For the calculation however, it is rounded just like all other values. This shows in damage calculations. So there are no exceptions, the bonus value is 25% of the main one and it is rounded. When in a set, the (rounded) bonus value is boosted with 20%, not rounded. Proof of (main-2)/8=integer, then round down 25%. That's is a brilliant observation! I thought it has something to do with computers using binary numbers but didn't see the pattern. 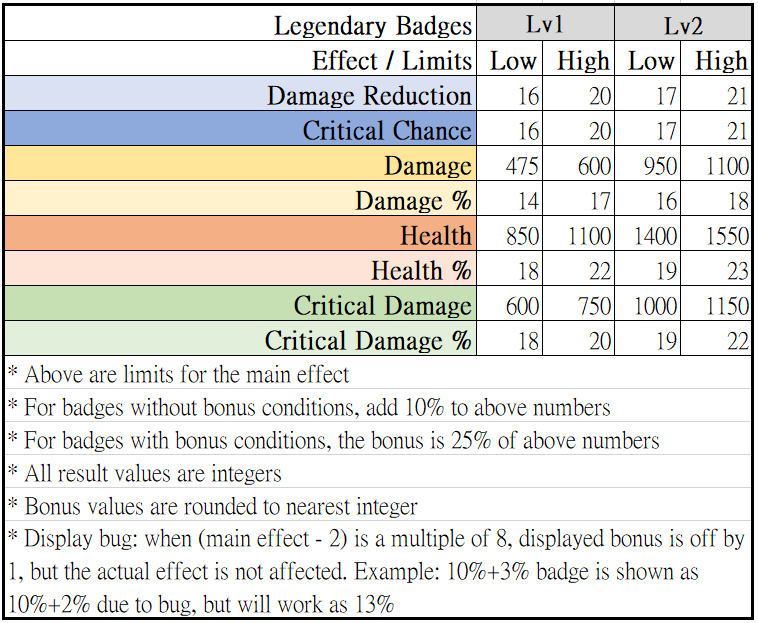 A damage badge with main effect of +10%, will have a bonus effect that says +2%, but is actually +3%? Yes, exactly. The proof is a little harder. But for health and damage calculations this is the only way to get exactly the damage and health values shown on your survivor screen. Altho I agree with you, they draw attention to issues like these when they start charging for things which depend on this system being accurate. So if you are going to announce an improvement, be prepared for the backlash that comes with it when that system doesn't turn out as intended. I'm not sure @ATLAS-Z is the type for the numbers and math behind the scenes. There was a thread a little while ago with some examples of improved badges. In my experience, based on what I have and what I've seen it looks like crit damage, crit chance and damage reduction were bumped up to the previous max you could get with a health badge. Previously 23+5 with set bonus but I've seen a 26+6 crit damage and I crafted a DR badge which becomes a 25+5 with set bonus. The previous max damage badge was 20+4 in a set and I crafted a 21+4 badge. I've not seen whether health badges have been given a higher max. I had health badges crafted before the update that were 24%, but with no bonus, so the chart posted above is not accurate for Health badges. For DR, I crafted a badge at 23% after the update, so that category is also incorrect. Thanks for clarifying @jimmorrison369 . > I'm not sure @ATLAS-Z is the type for the numbers and math behind the scenes. There was a thread a little while ago with some examples of improved badges. I'm not sure if I'm suppose to be offended or not? Lol. I aced 4.0 all my math/science calculus, Physics, chemistry, etc in college, but that was a long time ago haha. BUT... No I don't crunch a lot of behind the scenes for NML. You are correct sir haha. I was just looking for those shiny crop shots. But if you guys want be crunchy on this thread, I encourage it.